Steve’s very kind. He tells me almost every night that whatever I have cooked is the most delicious thing I’ve ever made. Rarely does he say anything negative, and even if he doesn’t like something, the worst thing he’ll say is, “It’s good.” The other night I could sense his displeasure in the soup I made for dinner. I got the, “It’s good” response and could see Steve was having problems choking it down. I wasn’t pleased with the outcome, either. The recipe, “Creamy Fennel and Greens soup” is on epicurious.com, with a 3 1/2 out of 4 star rating. I thought that, at the very least, I would be able to use up some of the veggies in our fridge by adding them to what looked like a delicious vegetable soup. It wasn’t! With recipe in hand, I went to work chopping and sautéing the onion and fennel, cleaning the collard greens and spinach, adding water, cooking the collards, then the spinach, and finally blending everything together. I blended, and blended, and blended some more but it still wasn’t the smooth puree I was striving for. As I tasted the soup I realized it was missing something. It needed more salt, more spice, more pepper, and more fat. I added more salt, pepper, and whole milk to the mix (the recipe called for cream, which we didn’t have in the house) but it still wasn’t smooth or tasty. The consolation was that I knew it was healthy thanks to all those green veggies. A small consolation indeed. Usually, the food we eat has to meet three criteria: it has to be healthy, it has to taste great and it has to look like something we’d want to eat. The taste and looks were lacking with this one. 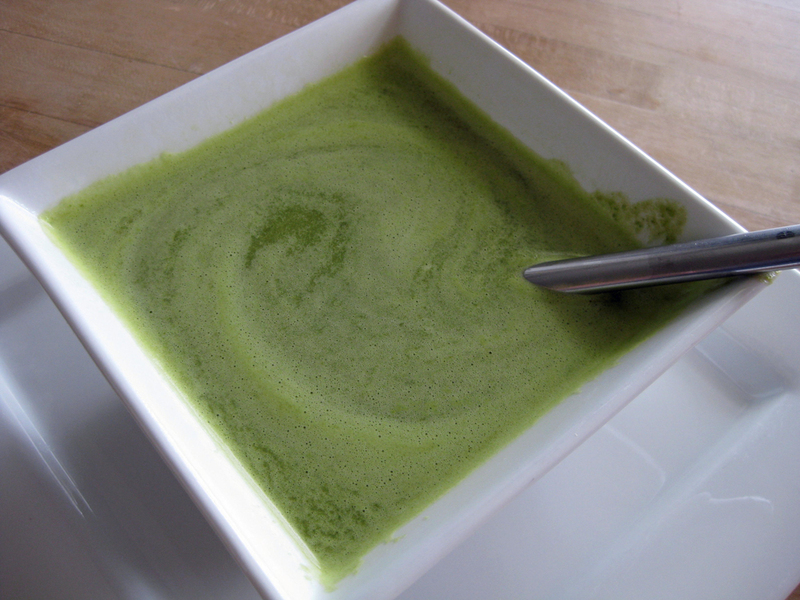 The soup looked like something scooped out of a swamp and tasted like it looked too, very very green. One of the fibrous veggies simply would not break apart in the blender and we found ourselves chocking back fibers that were so fine they reminded us of one of our cat’s furballs. Not the best soup I’ve made, but not the worst (very close). The next day I tried my best to doctor-up the swamp soup in an effort to turn it into something palatable. After straining the solids from the liquid I pureed the solids again. After 10 minutes of blending it still was not completely smooth. I then added more salt and reheated. I put half the soup back in the blender one more time and, with the blender running, added 4 tablespoons of cold butter to the warm soup. It helped enrich the soup but still didn’t help smooth it. Whoever gave this recipe a 3 or 4 star rating on epicurious.com seriously needs to reevaluate their culinary tastes. And the recipe writer needs to take a good, hard look at this one. We think it could use some work. Alas, I think this batch will just have to be eaten as a “nutritious” soup and not anything that looks or tastes good. I’m freezing the rest of it for one of those rainy days (I hope summer comes soon) because I just can’t stand the thought of wasting all those nutritious greens. If you do make this recipe, try eating the soup along with a grilled cheese sandwich to make it more palatable. After all, everything tastes better with grilled cheese! Heat oil and butter in a 6-quart heavy pot over medium heat until foam subsides. Add fennel, onion, 3/4 teaspoon salt, and 1/8 teaspoon pepper and cook, stirring occasionally, until softened and lightly browned, 7 to 8 minutes. Add leafy greens (but not spinach) and water to pot and simmer, covered, until greens are tender, about 30 minutes. Stir in spinach and cook, uncovered, just until wilted, about 1 minute. Purée soup in batches in a blender (use caution when blending hot liquids) until smooth adding chunks of butter to the running blender, then return to pot. Stir in cream and lemon juice and reheat over low heat. Season with salt. Cooks’ note: Look through your spice rack to add some flavor to this soup, maybe crumbled bacon or blue cheese on top would help. Also try adding a potato or two to the soup when cooking the collard greens. This will give the texture a more velvet feel. Soup can be made 2 days ahead and chilled. Reheat or serve cold. HAHA! When I serve something like this–too vegetal–my father-in-law always says “I had a really big lunch”. That is the polite code for “I hate it”. The soup looks GREAT to me! I got a tip once that you can improve the texture of green vegetable soups by pureeing them with (cooked) brown rice. I do this when I make broccoli soup, and it helps. Otherwise it just tastes like bitter green water. 2. chinese have a soup/porridge made from boiling rice until it is all but dissolved. It has a very rich flavor which can be the base of many kinds of soups. I really do like that you publish the non-winners. That looks like a recipe I’d try, given I love collards.